← Congratulations to Eagle-Eyed Editor … Our Third Winner! 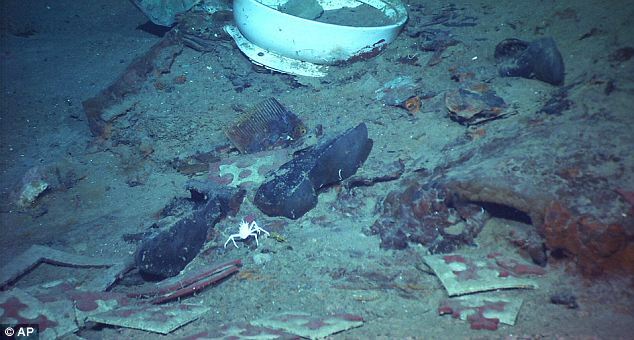 Shoes on the bottom of the ocean with the wreckage of Titanic have been getting quite a bit of attention. But what do the shoes really tell us? First let us see what people are saying. ” … it is important to remember that the sinking of the Titanic was a tragedy which took about 1500 human lives. One of the most compelling and disturbing images is a photograph of a pair of shoes. That image makes us realize that this is not just a pair of shoes, but the shoes that belonged to a person.” (The photograph below is the one referenced in the quote, the caption is mine). 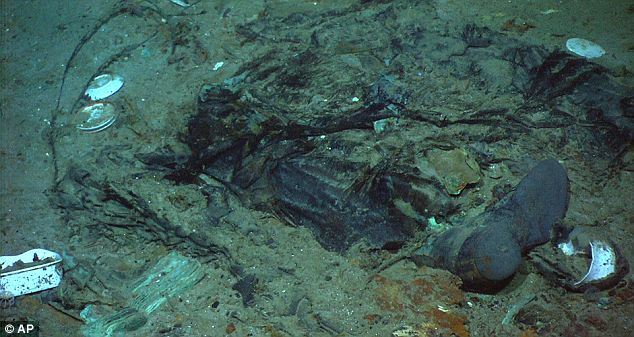 This image, from the Titanic wreck, has been used in many books and on many web sites. Some even going as far as to say these shoes were on a body that disintegrated. If that were true they would fsten the same way, the left shoe fastens on the outside of the shoe and the right shoe does not. Not a normal way of fastening shoes, Shoes either slip on, fasten infront, or BOTH shoes fasten on the outside. Here are more photographs of shoes from the Titanic from around the web. 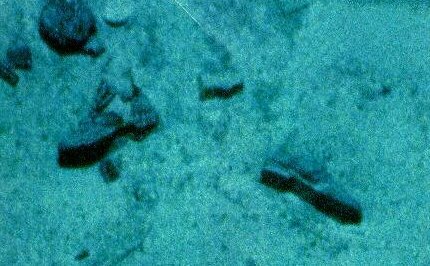 There are four shoes in this photograph from Titanic's wreck. The two shoes in the foreground have a heel of different heighths, but are reported as a pair of shoes from a disintegrated body. The photograph below is of a pair of shoes with what is most probably a coat. James Delgado, the director of maritime heritage at the National Oceanic and Atmospheric Administration has said, “These are not shoes that fell out neatly from someone’s bag right next to each other. The way they are laid out makes a very compelling case that it is where someone has come to rest.” The left boot (one at the bottom) would have an ankle at a 90 degree angle to the right boot. I can put my feet into that position, but it is not a normal way for feet to fall. What are the chances that a dead body could fall through more than 12,000 feet of water and end up like that? Not very good. Try putting your feet into that same position, once you are there, now imagine falling over 12,000 feet through water and having your feet land like that … naturally. 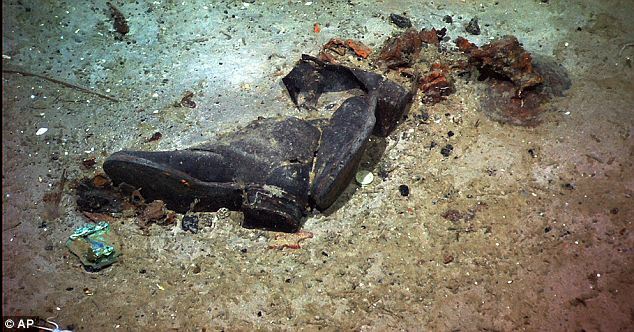 This is a pair of shoes from the Titanic wreck. However, the angle of these shoes to each other makes it doubtful there were feet in them while they were laying like this. It is possible that one of the shoes has been moved slightly by the ocean currents. To many, every shoe represents a body that was on the ocean bottom with the Titanic. This is not true. I do not intend to say no one sank with the Titanic, quite the contrary. Mr. Shepherd, an engineer, broke his leg in boiler room number five. Engineer Harvey and Leading Stoker Barrett carried him to the number five pump room. When the bulkhead wall collapsed Harvey and Barrett barely had enough time to escape and had to leave Mr. Shepherd in the pump room, where his remains are to this day. Those who claim a body for every shoe are jumping to conclusions without investigating the facts. One web site quotes Dr. Ballard as pointing to an image of a pair of shoes on the deck of Titanic near the railing and saying “Those shoes did not just land like that, there was a body in them.” If someone had been at that location when the Titanic sank, they would have been washed off the deck as the ship fell through 12,000 feet of water. The leather suitcases remain today on Titanic because they were made from tanned leather. However, not everyone on Titanic could afford leather suitcases. Titanic’s seaman and engineering crew would have used ditty bags made from cotton or canvas, and many of the third class passengers would have used the same. Also, just as today, there would have been luggage made from cloth that would have disappeared in the decades right after the sinking. Shoes packed together, just has we do today, would then be left on the ocean floor beside the clothing they were packed with, without any signs of the luggage they were in. The photograph below appears to be just that. Titanic shoes laying on what appears to be several layers of clothing. I disagree with Kathy A. Miles and Charles F. Peters II (copyright holders and purveyors of starryskies.com). Here is the evidence I put forward to support my view (also from the web). An article in the UK Daily Mail that lists just 12 of the hundreds of tweets on Twitter from people who did not know Titanic was real. They thought it was just a movie. No, Elizabeth will never forget what happened. At 5 Elizabeth knows what those adults on Twitter did not, people died, kids too … Titanic was real. This is why it is important for some artifacts to be brought up and shown. Do we need 6,000 artifacts to show? No, we do not, but we do need to show some of the artifacts. It is impossible to deny the tragedy when you are faced with the results only inches from your nose. In the 1960’s and 1970’s there began an attitude among every day people that we need to protect whales from hunting and dolphins from being killed during tuna fishing. Coincidence? There are no coincidence in life. In the 1950’s and 60’s Marineland of Florida (www.marineland.net) was getting 500,000 visitors a year. Marineland was started in 1938. In 1964 four UCLA graduates started Seaworld with a few dolphins, sea lions and 6 attractions, they had 400,000 visitors in their first 12 months. For decades school children have gone on class trips (I went on class trips to Marineland as a child). After the shows, the kids are brought up to meet the trainers and marine performers. These dolphins and killer whales are real to these kids. They petted them and had a chance to look those animals in the eye. When those children, as adults, learned dolphins and whales were in danger, they acted. I do not like dolphins and orcas being tank animals,but those tank animals have saved the species. I hope children always have a chance to look into the eyes of a dolphin and fall in love with them. Being able to see, for yourself, and sometimes hold artifacts; creates a personal feeling, an attachment to an event like the sinking of Titanic that no book or TV program ever will. Is the Titanic a grave? Yes, it is. At least for Mr. Shepherd, it is and that is enough for me. Kids being able to see a dolls head that a child on Titanic loved, a child who died on Titanic, will do more to protect Titanic than these well intended people will. Mr. Peters, Ms. Miles, and Dr. Ballard are well intended. However, if they claim a body for every shoe, without verifying there actually was a body in those shoes, then someone will come along and prove that not every shoe represents a body. When that happens, all the good work they tried to do will be undone. Good intentions are not enough reason to skip research or to lie. Titanic needs to be protected. I am betting that when Elizabeth grows up she will want shipwrecks protected too. Really Mr. Peters? I don’t agree, I will never forget it. I know a 5 year old little girl that will never forget it. Just as my generation step forward to protect marine animals because of Marineland and Seaworld, Elizabeth’s generation will step forward to protect the Titanic and shipwrecks because of RMS Titanic Inc.
Mr Peters and Dr Ballard may not like that, they may not agree with that. That is ok, PETA and SPCA, don’t like Marineland and Seaworld either, but it does not change the fact that me and other little kids like me grew up and put money and our time into protecting whales and dolphins, because of the animals we fell in love with at those marine parks.. SO WHERE DID THE BODIES GO? Glad you asked. Read the testimony of the survivors of Titanic and each says, everyone they saw was wearing life vests. I am sure some people were not. I know Mr. Shepherd was not, probably Mr. and Mrs. Straus too. Mr. Guggenheim and his valet took theirs off. However, out of the 2200 people on Titanic, it would not be an exaggeration to say that most likely over 2100 people were wearing life vests. One web sites says that there were not enough life vests on board Titanic. Really? Titanic had 3,560 life vests on board, more than the number of people the ship was allowed to carry, certainly more than the 2200 people on board. What does the life vests have to do with bodies on the Titanic wreck site? A cork life vest, like those on Titanic, when submerged in water for 48 hours only gains 3% weight from water. There was a current to the south of about one knot (one nautical mile), in 48 hours a person from Titanic in a life vest in the water would have floated about 48 miles south of Titanic. The last person found floating from Titanic was found, in a life vest, hundreds of miles from where Titanic sank 6 weeks after Titanic sank. The people in life vests, by the time those life vests became water-logged, would have sank to the ocean floor far from the site of Titanic wreckage. There is never a good reason to be “loose with facts”, or to knowingly say something that we know to be untrue. Good intentions is not a good enough reason to skip important research or to lie. We need to know exactly what happened and why to prevent this from ever happening again (it has happened again since Titanic sank, but with less loss of life). Inaccuracies will only hurt our efforts, we must be as accurate as we can at the time we make our statements. 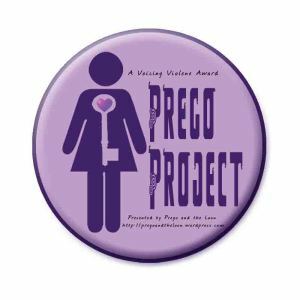 Inaccuracies only detract from our work at prevention. We must prevent this from ever happening again, that is the true memorial to those who died with Titanic.